Universal has made it official, announcing that it’s acquired the rights to produce three films and a TV series based on Stephen King’s “The Dark Tower.” The studio had been in talks for five months among King, Akiva Goldsman’s Weed Road and Brian Grazer and Ron Howard’s Imagine Entertainment. King’s seven-book series is set in an alternate world resembling the Old West and focuses on the last member of an ancient order of “gunslingers” and his quest toward a tower that’s also the center of all universes. 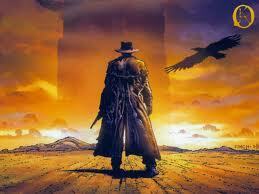 First book, “The Dark Tower: The Gunslinger” was published in 1982. Final book, “The Dark Tower VII,” was published in 2004. Howard will direct the first film and the first season of TV, which will be written by Goldsman — who will produce the film through Weed Road with Howard and Grazer for Imagine. Plans are for are the first film in the trilogy to be immediately followed by the TV series that will bridge the second film. Howard, Grazer and Goldsman will executive produce the TV series for Universal Media Studios. Copied from THURSDAY SEPTEMBER 9, 2010 FilmNewsBriefs newsletter. ~ by alejandroseri on September 9, 2010.